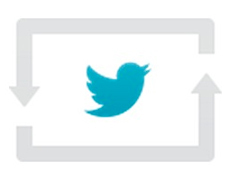 Until now, Twitter-commerce was only possible through referral links, with conversion rates somewhere around 0.5%. But Amex has come up with an innovative way to sell socially — without a checkout process. 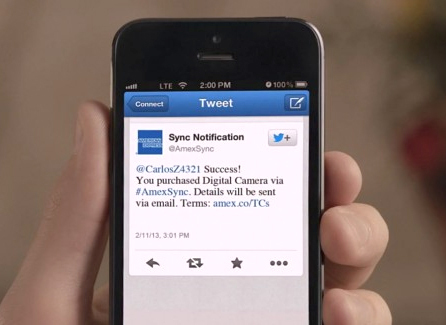 Amex Sync lets you buy with just a #hashtag. How it works is simple. 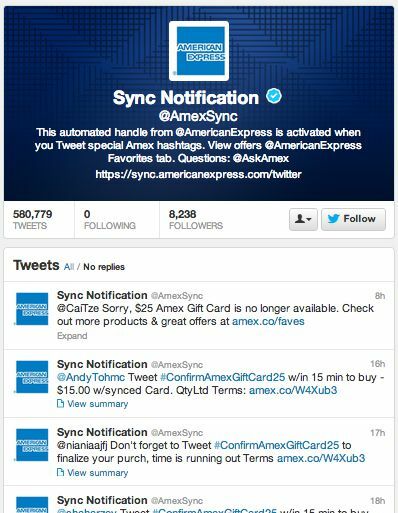 Amex holders sync their card and Twitter accounts, and follow @AmexSync to watch for deals of the day and corresponding hashtags. @AmexSync will respond with a confirmation hashtag, which the user must retweet within 15 minutes. Product is delivered to the billing address connected to the Amex card. Amex also has a (previously launched) Offers program, where discounts can be claimed through the same process, and savings can be to purchase at the Offer retailer’s website (so long as the synced Amex is used for payment). Aside from making impulse buying frictionless, the brilliance is the baked-in social component — all sales through the channel are broadcast through the cardholder’s network. Twitter accounts must be public in order for @AmexSync to read and respond, so every offer claimed and purchase made is a public affair. Participating brands benefit from the social boost. Upcoming products include Kindle Fire, Donna Karan jewelry, Sony Action Cam and Xbox 360. What’s most intriguing is it’s not an online retailer that pioneered the convert-by-hashtag. Amazon and eBay could easily have done this syncing saved billing information, perhaps they will “follow.” Any telecom could leverage carrier billing, or any loyalty program to generate excitement and bump up point-churn. Of course, with all shiny objects, only time will tell if customers care about buying with hashtags. The more exciting aspect is the ability to buy through an independent channel without enduring the traditional checkout process, or even visiting a website.